On May 1, members of the ALS community visited Harrisburg for an advocacy day and to raise awareness of the need for ALS funding. During an event in the Capitol Rotunda, the ALS Association presented Rep. Bryan Cutler (R-Peach Bottom) with a plaque for his efforts on behalf of Pennsylvanians living with ALS. The House also unanimously approved a resolution authored by Cutler to recognize May as ALS Awareness Month in Pennsylvania. 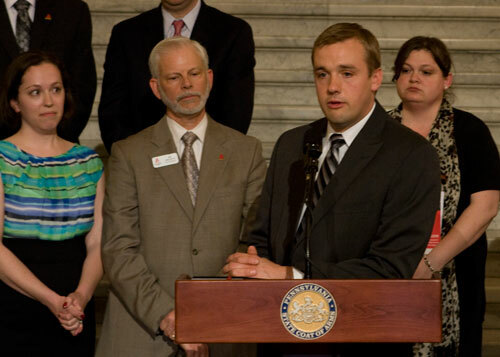 HARRISBURG – Tapping an issue that has personally impacted his life, Rep. Bryan Cutler (R-Peach Bottom) is raising awareness of Amyotrophic Lateral Sclerosis (ALS), or Lou Gehrig’s disease, and has asked his colleagues to support legislation to designate May as ALS Awareness Month in Pennsylvania. To view a video of Cutler’s comments regarding ALS, visit RepCutler.com. The House today unanimously approved Cutler’s House Resolution 674. The measure describes ALS as a fatal neurodegenerative disease, characterized by muscle weakness, difficulty swallowing and breathing, and eventually muscle atrophy. While the physical symptoms of ALS are severe, the patient’s mental function does not deteriorate, leaving the victim aware of his or her decline. ALS is typically diagnosed between the ages of 40 and 70, and men are two to three times more likely than women to develop ALS. More than 5,000 new ALS patients are diagnosed each year, and there is no known cure or prevention for the disease. The ALS Association today presented Cutler with an award to recognize his advocacy efforts and support for those fighting to find a cure for the disease. More information about ALS and Cutler’s legislative priorities is available at RepCutler.com and Facebook.com/RepBryanCutler.